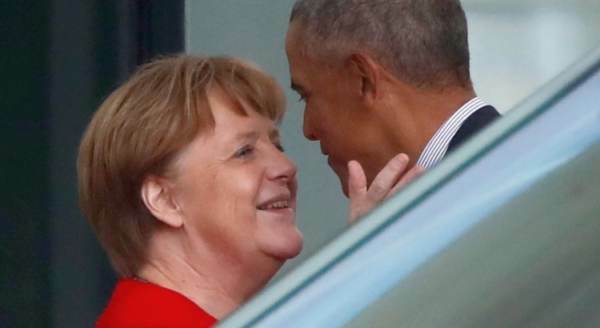 Angela Merkel met Barack Obama at the German Chancellery today - and looked far happier to see the former president than she has for the incumbent, President Trump. Obama embraced her after their meeting, which was believed to be to discuss Trans-Atlantic relations. Is he still shadow president of the deepstate? Just the haz-beans haz-beaning together... talking over old times when they were the socialists in power. Merkel’s spokesman Steffen Seibert defended the meeting as standard operating procedure and said she has met repeatedly with ex-heads of state and government “with whom she worked together closely and well for a time,” WRAL reported. LOCK HIM UP TOO! WHERE IS SALLY YATES WHO IS OH SO CONCERNED ABOUT LOGAN ACT VIOLATIONS! I agree and its more Disgusting that Obama is showing himself in Europe at a time when. -Obama promoted Open borders, Diversty agenda polices. Not a surprise that leftists welcome him. Where are the investigations into Democratic German Collusion?